Act 219: It's never too late. Ever since he can remember, he wanted to grow up to help sick people or deliver babies. So he studied biology in college. He ultimately became a nurse. He helped people with cardiac illnesses. 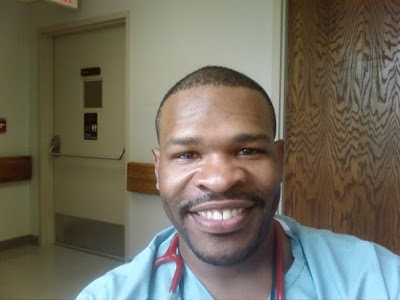 He worked alongside doctors in surgery rooms and tended to patients who required the highest level of care in ICU. For a long time, he worked as the director of nursing for a dementia care assisted living facility. For the last three years, he worked as a Hospice nurse. Last week, he quit his job and became a health sciences teacher for high-school aged students at the Coosa County (Alabama) Science and Technology Center. He always felt that black boys, in particular, needed to have more positive male role models. The Trayvon Martin verdict convinced him that maybe he could be one. Why are these descriptors so significant? So game-changing. When's the last time you considered switching career paths in order to make the world a better place? How many 41 year-old African-American male teachers did you have growing up? How might the lens through which you view the world look different....if you had one? Meet Gerald Hogan of Aniston, Alabama. He's 41. He's male. He's African-American. And because of him, countless black boys will grow up with the permission to finally believe in the value of those words.